Greed made a comeback on Wall Street. 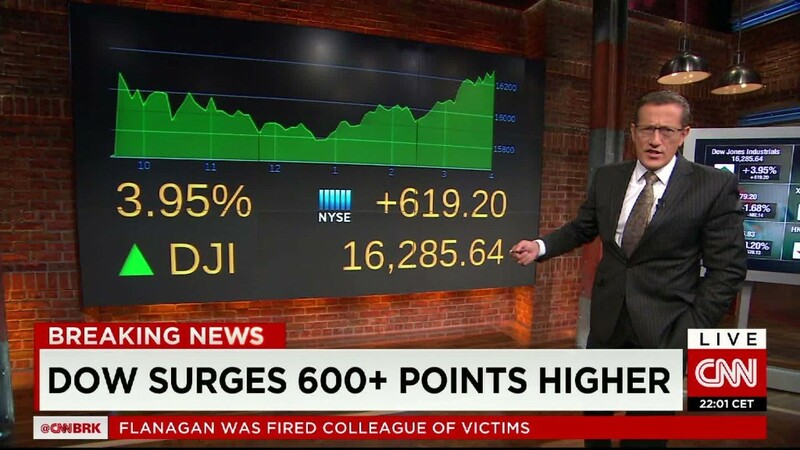 The Dow raced 619 points higher on Wednesday, its most emphatic point gain since the 2008 financial crisis. The huge rally represents a rebound following six days of dramatic selling that was driven by serious concerns about how China's slowing economy will impact the rest of the world. The S&P 500 soared 3.9% on Wednesday, its biggest one-day percentage gain since 2011. The Nasdaq surged 4.2% higher. The Dow's point gain was the third largest in its history. "We were sorely in need of a pop after the drop," said Sam Stovall, chief investment strategist at S&P Capital IQ. An eye-popping $2.1 trillion of value was wiped out from the S&P 500 in just the previous six trading days alone, according to S&P Dow Jones Indices. "This is investors being opportunistic and buying on the weakness. Unless you think there's going to be some massive slowdown in the economy, all of a sudden equities at these levels look attractive again," said Lori Heinel, chief portfolio strategist at State Street Global Advisors. There might be bargains to be had, given that for the first time in four years all three major U.S. indexes had tumbled into correction mode -- signaling a 10% decline from recent highs. The turbulent market moves recently showcased fears about how China's economic slowdown will impact the rest of the world. But global markets -- other than China -- seemed a bit calmer on Wednesday. While the Shanghai Composite retreated another 1.3%, Japan's stock market soared 3% and European markets held steady after Tuesday's big gains. Earlier this week China sought to calm turmoil in global markets by slashing interest rates. The hope is the moves will help stabilize China's economy and ease fears that the world's second largest economy is slowing drastically. Tech stocks were at the heart of Wednesday's rebound. Shares of Netflix (NFLX), Google (GOOG) and Amazon (AMZN) all rallied sharply. Other big winners include Abercombie & Fitch (ANF) and Express (EXPR) after both retailers reported profits that exceeded expectations. The recent American stock market tumble stands in sharp contrast with sentiment about the U.S. economy. The economy appears to be on track to continue its expansion from the Great Recession, even though growth may not be stellar. Further evidence of that was received on Wednesday. The government said orders for big-ticket items like appliances and cars jumped by 2% in July from June. That was significantly more than economists had anticipated. Crude oil prices struggled to follow the broader markets higher. Oil retreated to about $39 a barrel, leaving it down 17% this month alone. Despite the monster gains on Wednesday, analysts warn stocks may be vulnerable to further losses. Stovall noted that during the recent turmoil, the S&P 500's price-to-earnings ratio only fell back to the median level of the last 15 years. Since markets tend to overshoot to the downside, that key valuation metric would be expected to fall further. "The dust doesn't settle in one day," said Stovall.